If you are looking for a TV that offers outstanding performance and a wonderful design while still being easy on your wallet then the Sansui SJV24FH-2F 24 inch LED TV is what you are looking for. Watch high-octane action films, intriguing documentaries, gripping TV shows, electrifying music concerts, sports and more in an impeccable picture quality. 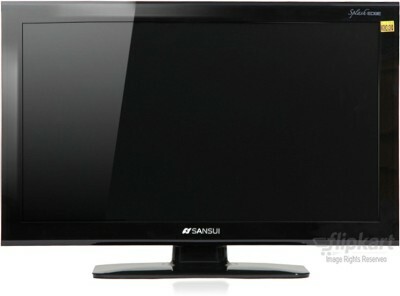 Gripping Visuals The Sansui SJV24FH-2F sports an LED-backlit LCD display which produces luscious and vibrant images. Also, LED TVs consume less energy in contrast to other TVs, thereby they help you in saving on your electricity bill. This TV accepts 1080p signals in native resolution format as it incorporates Full HD technology, meaning that it can deliver an image resolution of 1920×1080 pixels; you can now watch blockbuster films in a stunning, crystal-clear picture quality. Possessing a compact size of 24 inches which is complemented by a sleek design, the Sansui SJV24FH-2F can be mounted onto any wall of any room in your house, be it your living room or bedroom; it enhances your home’s interior as well. A high contrast ratio brightens the darkest parts of images and meticulously renders dark shades and colours; horror films will be all the more terrifying, now that you can see all that goes on in the darkness in the movies. This TV can display 1.06 billion colours, hence you can see the hues that exist in the RGB spectrum in all their brilliance. Seamless Connectivity The Sansui SJV24FH-2F comes equipped with a USB port to which you can connect a USB drive so as to view all of its digital contents such as videos, music and photos, hence all you need to do in order to watch a film that someone you know has with them is tell them to store it on a USB drive and to give the respective data storage device to you; connect the USB drive to your TV and enjoy. Furthermore, you can connect external HD sources such as a computer, smartphone, gaming console or Blu-ray player to this TV with the help of an HDMI cable. Spectacular Sound The Sansui SJV24FH-2F boasts of 2 speakers which give an impressive sound output. A 5-band equalizer allows you to adjust the sound settings the way that you want to experience your favourite music and more.